We once went to an island called Grand Canaria in Spain for holidays one year. It was about 30-minute drive form Las Palmas, the capital. The beach used to be a desert, but became a white sandy beach under the strong sunshine when the ground had physically moved in part. You can see the Northern part of Africa from this beach. Although I don’t recall seeing any Asian people, I wonder any Japanese businessmen working for trading companies live there. Anyway, there were many German guests for long holidays, and German language was more popular than English at the hotel. Away from city life, in the resort where everything could be done within the hotel, for those who usually stay for 2 weeks or as long as 1 month, a small society-like system is born, although you could be lazy and footloose. You will be required a certain sociability that maintains a certain distance from each other within the group. On the Asian beaches, even at some prestigious hotels, you can be an easy goer, not paying too much attention to what you wear. Compared to that, it is quite a different story in European hotels in high season. It is forbidden to wear the same clothes everyday. Rules are slightly different for breakfast, garden lunch, and dinner. Well made up faces. For those who do not swim, that works since they don’t put their faces in the water. On their feet, stilettos instead of rubber flip flops. Of course, bikinis will change everyday. Therefore, the color of the stole and sandals will change accordingly. Doesn’t it require lot of energy? This overwhelming gesture to show off something casually was one of the biggest culture shocks for me when I moved to Europe. While we enjoyed several dinners in the restaurant in the garden at night, we went out occasionally, as we got tired of after a few days. One evening, we asked for a taxi to take us somewhere near the port. Several simple restaurants were seen in the surroundings of a quiet port. The hunch in this kind of situation cannot be complained even if it does not prove right. Right beside an old poster of a sun-tanned girl in bikini, the pictures of shrimps, lobsters, squids, octopuses, and other fish which names I did not know, were pasted on the wall one by one, and the menu had pictures of the dishes they served. Everything looked good. I would love to try all. My husband loves mollusk. If it was hard to decide, we could order both, but 2 plates of mollusk were not easy to take for me. Finally, after much agonizing, I decided on the squid. After a short while, 8 Spanish people that looked like a family and friends, lead by a man who looked like the father, came to sit at the big table next to us. They opened the menu and closed it after a quick glance. It somehow appeared to be a confirmation work, and no hesitation was observed. Anywhere in the world in common is that the dishes that locals eat are the best. On the plate brought shortly after, a huge octopus, I was sure it must have measured at least 30cm in length, was placed with its legs boldly rolled up, in front of each member of the group. 8 Legs, which meant they were all the legs of one huge octopus. It was quite an overwhelming sight. Of course, it was not a decent manner to observe other tables in a restaurant and we fully understood that, but we could see as it was in sight. It appeared that the octopus was easily cut by knife. And, we could feel its juicy texture that we imagined judging from the softness of the flesh despite its large size. I was not saying that our squid was bad. After a long swimming in the North Atlantic Ocean, just unloaded this morning from the small boat of a fisherman, the squid was delicious, of course. Since then, whenever we go to some island, my mind is thrown into chaos between octopus and squid. However, I would love to see a huge soft-looking octopus legs placed in front of me, like that family, and I still dream of eating that without hesitation until my stomach is full. Novartis, a Swiss pharmaceutical company, impresses us every time with its unusual visual. 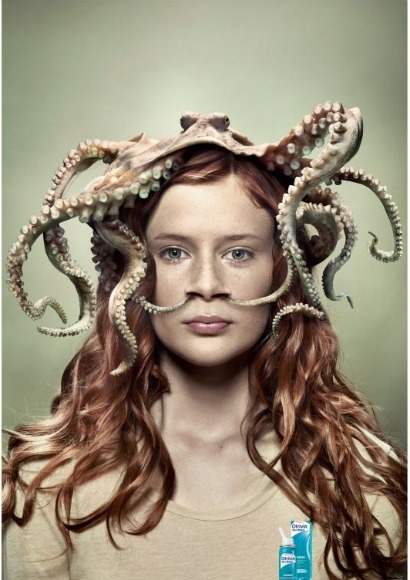 The series consists of 3 images of octopus, crab and sea horse. After all, octopus is the player. This bold visual communication is a success. It was created by Saatchi & Saatchi in Tel Aviv and Switzerland, and developed in Sweden. Description: A print campaign for Otrivin nasal decongestant.